On our first full evening at the Sandestin Golf & Beach Resort we took the free tram to The Village of Baytowne Wharf in Sandestin. 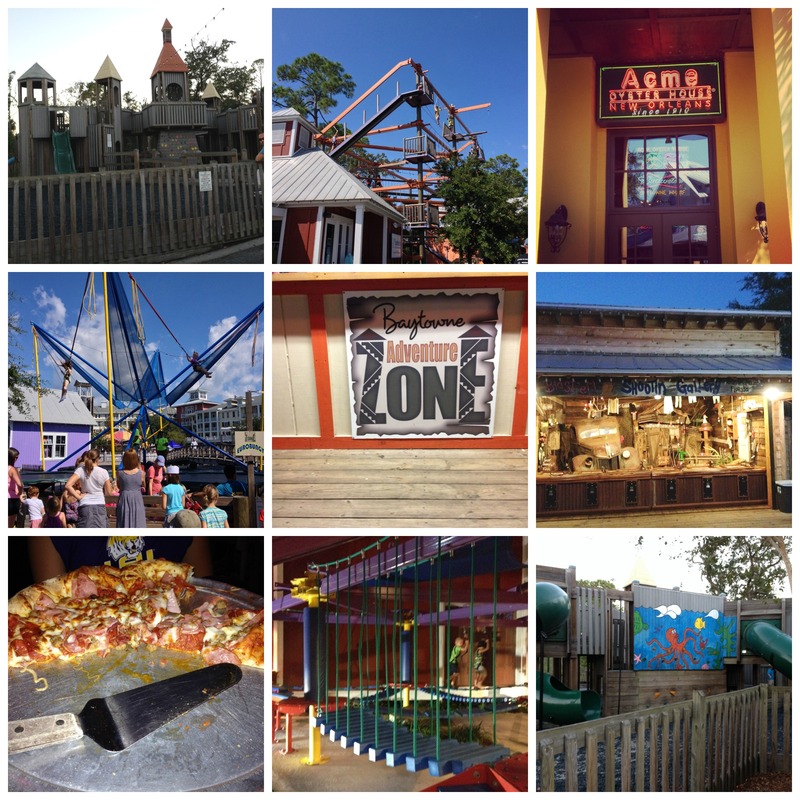 We knew there would be shopping and a various selection of restaurant options but there was also family fun that awaited us at The Village of Baytowne Wharf. I love that we are experiencing Sandestin in the fall. There are zero crowds and short wait times compared to summer travel which means we can have more experiences while we are in town. My kids are getting older, but enjoying the carousel is something they enjoy. 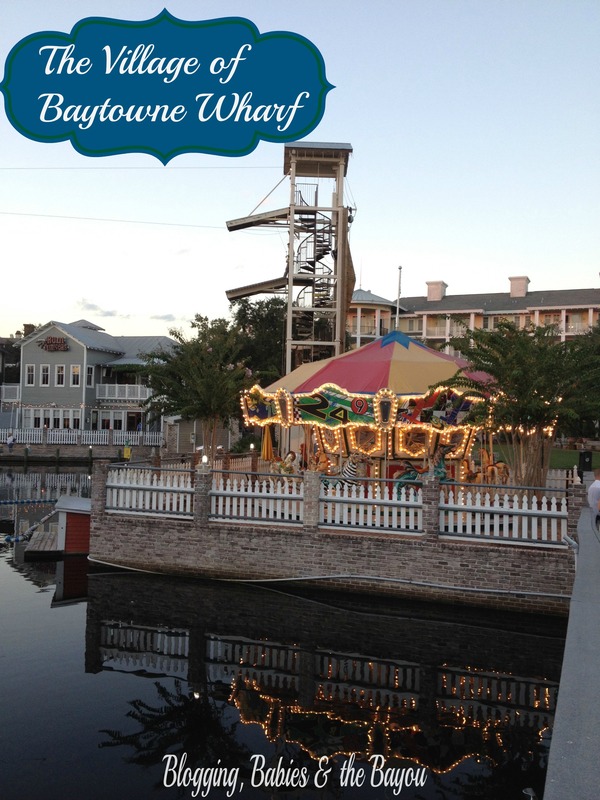 The very first family fun attraction we experienced at The Village of Baytowne Wharf was the Baytowne Carousel. 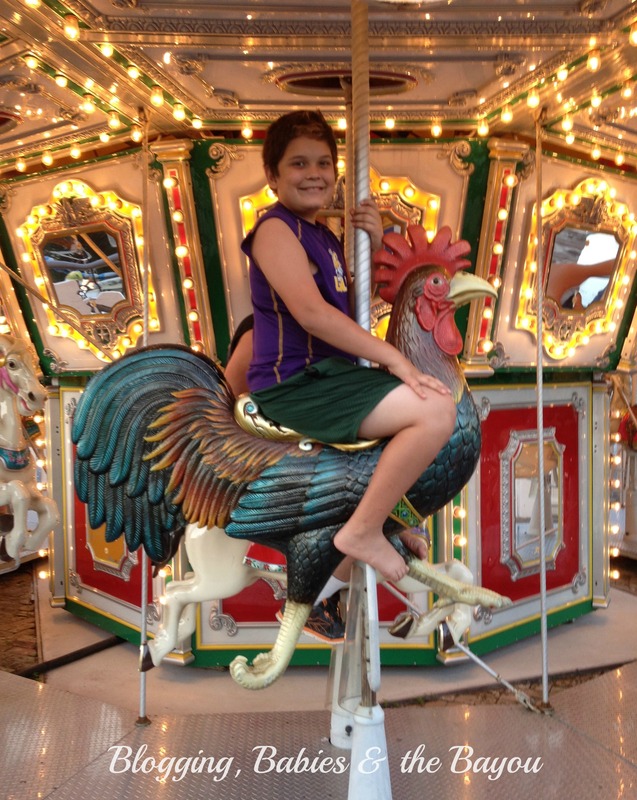 Did you notice the rooster my son chose to ride? It definitely made us think of our Dixie Chicks that are back at home waiting on us. 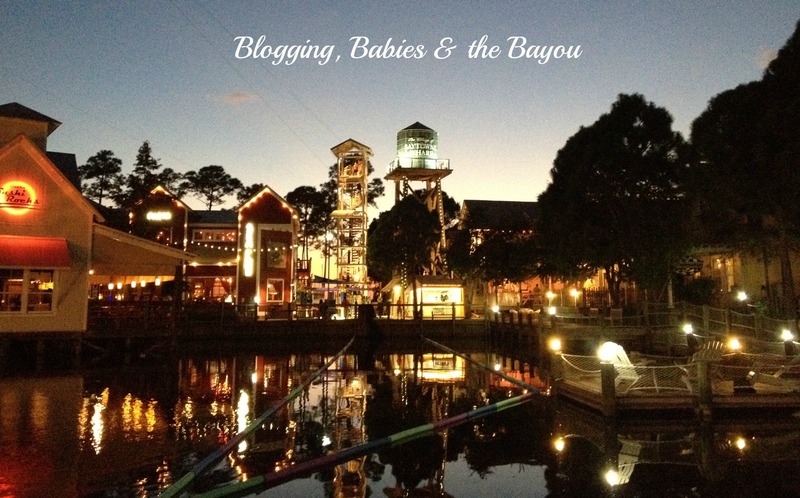 The nostalgic feeling of the Baytowne Carousel will put a smile on any riders face. Hours of operation are subject to change depending on weather conditions and business levels. When we visited the carousel, we were the last 4 riders before it was ready and full for takeoff. Notice the tower directly next to the Water tower? The Zipline was staring right at us and my kids were unsure about taking the plunge! I have a fear of heights but have zipline in the past during another Florida adventure. I wanted my kids to try it, so I encouraged my daughter who is normally the more adventurous of the two kids to go zip-lining as well. By encouraging, I mean bribing! Well “encouraging” worked because my husband went first, followed by my teen daughter & 9 year old son. 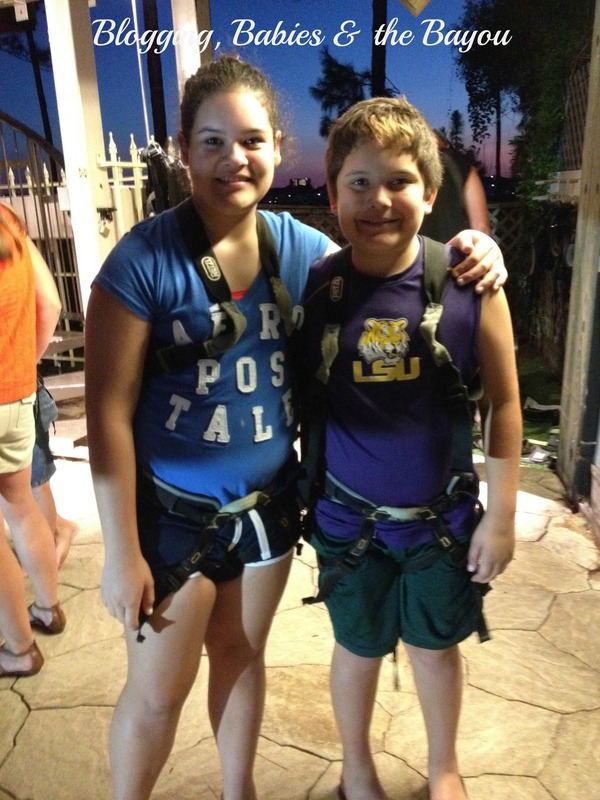 My kids both said Ziplining was their favorite adventure activity of the trip and wanted to go again! In fact, my daughter thanked me right after because she really enjoyed it & felt she would have missed out and regretted not participating had she left Sandestin without trying it. 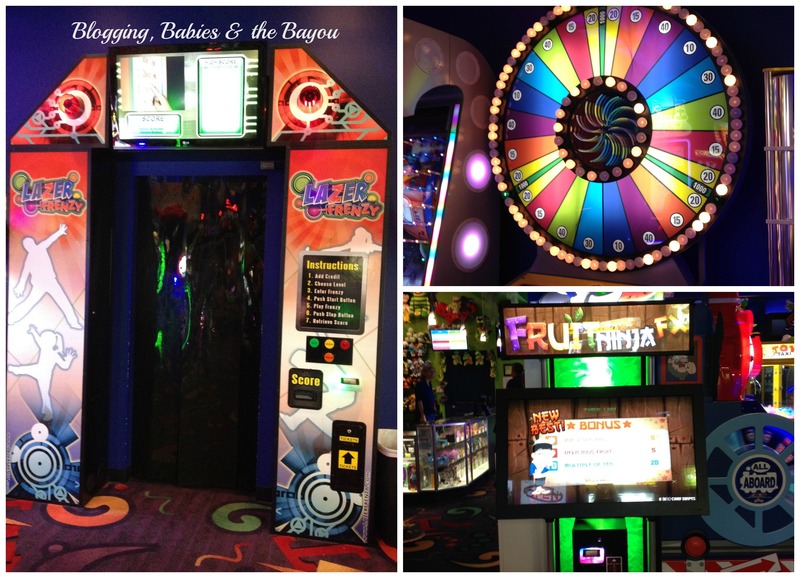 We also enjoyed the arcade while we visited The Village of Baytown Wharf. 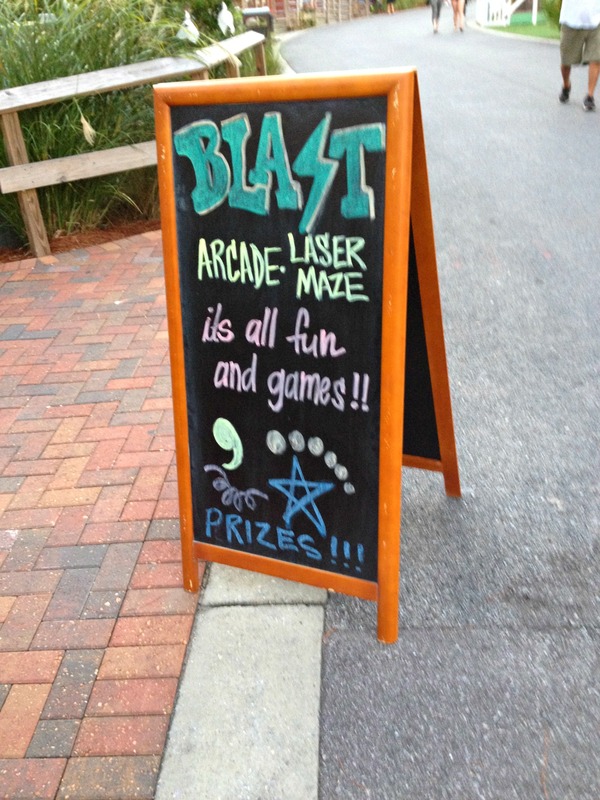 My son is the “token master” so he had a great time at Blast Arcade & Lazer Maze. It seemed like a popular local attraction as well as for tourist. A birthday party was being held there as we left the Arcade. The private party room was large and perfectly decorated before the guest of honor even showed up. I was tempted to ask for admission so I can take pictures but I figured I could direct my readers to their Facebook page if you are interested in the party room. Each family friendly activity at The Village of Baytowne Wharf has a different admission fee associated and are open year around depending on inclement weather. There is also a large adventure playground that is perfect for the small children in your life. The Adventure Playground is free of charge and a great way to let the little ones release some energy before heading to a restaurant. The Village is accessible from your own vehicle in a private parking garage, by taking the free Sandestin tram and by hopping on your bike or golf cart. We actually went twice, once by tram and another time while bike riding. What kind of Family friendly activity are you looking for when traveling with your children? That looks like so much fun! That pizza is absolutely drool worthy! I am craving pizza so bad now! That looks like a great place to visit, except for the rooster, I am terrified of them – fake or not. That is too funny, we had some that would chase only me down, it was awful. My parents used to just laugh at me because I was terrified to go out. We’ve been looking for a place like this. Looks like a fun place for us to drive to for an extended weekend family fun trip. Thanks for sharing. That looks like so much fun!! I love family activities like these. I’m glad you guys had fun! What fun! My boys would love the arcade. Our family looks places that offer a variety of things to do in one place. My family needs to make it to that area some day. Oh my, that looks like such a fun place to visit! This looks like such a fun place to visit as a family. I like that there are so many activities to do! Wow! There’s a lot going on here! Reminds me a little of Santa Monica, Ca though. Hope everyone had a really great time! It looks like a great place to visit for the entire family. Looks like so much fun, would love to visit Sandestin.